Click here to download the PDF of the story. In a perfect world, everyone would live by a common rule: Sharing is, in fact, caring. In previous generations, communities would band together on projects and share materials, skills and equipment when one member didn’t have everything they needed. After all, the barn raisings of years past didn’t include just a few guys with a free afternoon. While tight-knit communities haven’t gone completely by the wayside, there are other avenues for consumers to borrow products. 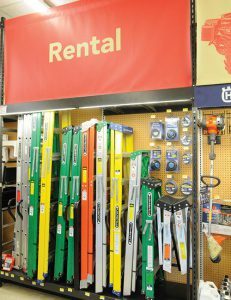 Hardware retailers are expanding their rental departments and finding success. Heavy-duty lawn and garden equipment can be expensive for a single-family unit to maintain, while individuals working on projects might not want or need power tools on a regular basis. 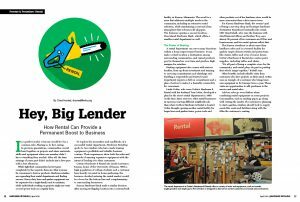 To explore the necessities and roadblocks of a successful rental department, Hardware Retailing spoke to two retailers who have made loaning equipment a profitable and reliable business venture. Their experiences show both the risks and rewards of carrying expensive equipment with the intent of lending it to their customers. Cottin’s Hardware & Rental sits inside Lawrence, Kansas, home of the University of Kansas. 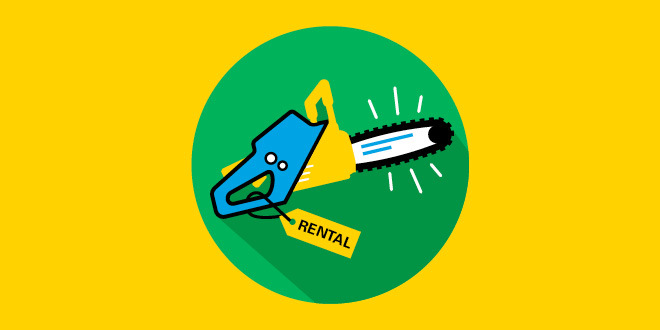 With a high population of college students and a customer base heavily invested in home gardening, the business decided entering the rental market would be a boon for the bottom line and complementary to surrounding businesses. Kasson Hardware Hank made a similar decision after moving its flagship location into a custom-built facility in Kasson, Minnesota. The result is a store that addresses multiple needs in the community, including an extensive rental selection, while maintaining a neat and clean atmosphere that welcomes all shoppers. The business operates a second location, Pine Island Hardware Hank, which offers a smaller rental department as well. 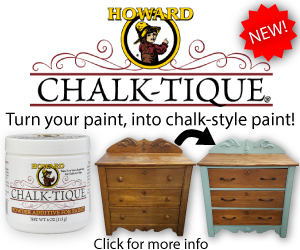 A rental department can serve many functions within a home improvement business. It can make a retail location a destination among surrounding communities, and rented products pay for themselves over time and produce high margins for retailers. Renting equipment also comes with serious hurdles, from up-front investment and training to servicing commitments and shrinkage risk. Building a respectable and trusted rental department requires a full-on commitment and a plan of action to make it a desirable commodity for consumers. Linda Cottin, who owns Cottin’s Hardware & Rental with her husband Tom Cottin, developed a plan for the store’s rental department in 1999. At the time, there were two other rental businesses in Lawrence serving different neighborhoods than where Cottin’s Hardware & Rental is located. Cottin thought opening another rental facility for larger lawn and garden items, power tools and other products out of her hardware store would be more convenient than a drive across town. For Kasson Hardware Hank, the owners’ goal of being a one-stop shop and boutique hardware destination transitioned naturally into rental. CEO Greg Kuball, who runs the business with chief financial officer and brother Troy, says almost 90 percent of his customers are DIYers and homeowners, and his rental options reflect that. The Kasson storefront is about more than hardlines sales and is a trusted facility for quality carpet cleaner rentals and party items like chairs, tables and even a bounce house. Cottin’s Hardware & Rental also carries party supplies, including tables and chairs. “It’s all part of being a complete store for the community, and rental plays its part in putting that whole image together,” Kuball says. 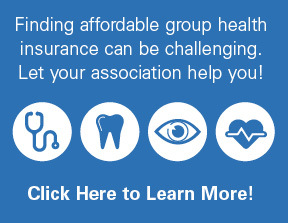 Other benefits include reliable visits from customers who have projects on their mind. Cottin uses an example of a customer who brings lawn care equipment in for tuneups twice a year. Those visits are opportunities to add purchases to the service and rental sales. Add-on sales go even further when combining rental equipment on some projects. Consumables, such as sanding paper, go along with renting the sander. If a customer is planning to start a garden, retailers should look to supply needs like seeds and fertilizer along with the tiller the customer is renting. 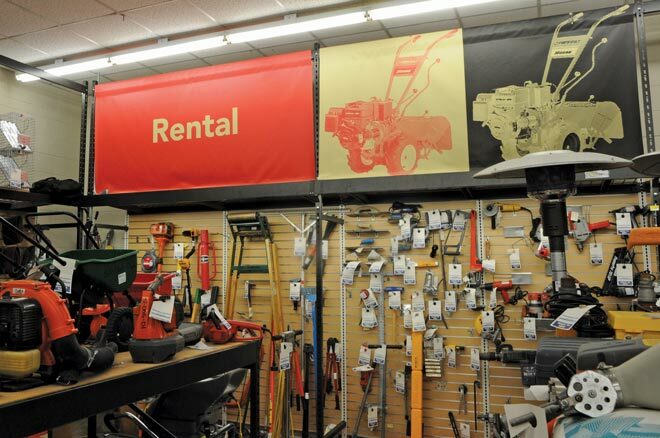 The rental department at Cottin’s Hardware & Rental offers a variety of tools and equipment, such as trowels, angle grinders and staple guns.The selection is designed to best serve current customers and assist area contractors. When deciding on selection for their rental departments, both Cottin and Kuball considered their immediate neighborhoods and the needs of their customers to determine the best mix of rental products. gas saws, demo hammers and jackhammers. Kuball went all-in for his DIY customers, renting items like pressure washers and dehumidifiers all the way up to Kasson Hardware Hank’s largest purchase to date: A motorized, four-wheeled compact utility loader that can accommodate a variety of attachments, such as an auger, a front- load bucket or cargo forks. He says the loader is the largest piece of equipment he is comfortable renting to customers, but it has provided a much-needed level of convenience for local contractors. “This utility loader was a large investment, and we’re hoping it pays for itself in three years,” Kuball says, adding that the nearest comparable rental loader is in Rochester, Minnesota, about 16 miles away. Rental offers opportunities for add-on sales. Some projects require more than just a power tool, and a retailer prepared for all needs can find success. their markets showed interest, from basic items like tables, chairs and tablecloths to popcorn machines, cotton candy makers and bounce houses. Cottin’s Hardware & Rental added its largest rental item, scaffolding, when contractors asked if it was available. Similarly, when a local school that utilized its party materials asked if the business could provide a commercial flat-top griddle for rent, the store responded. Rental offers opportunities for add-on sales. Some projects require more than just a power tool, and a retailer prepared for all needs can find success. A large variety of products for rent won’t guarantee a strong rental following if they’re not in optimum working condition. Enough return trips to the store and customers will quickly consider a business as not worth the trouble. 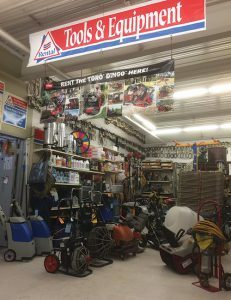 To prevent problems and unhappy customers, both Cottin’s Hardware & Rental and Kasson Hardware Hank put great emphasis on servicing rental equipment as well as evaluating product wear and tear. However, they do go about their servicing needs in different ways. Kasson Hardware Hank established a strong relationship with Earl’s Small Engine Repair, a business that has a dedicated repair service department. Kuball has employees who are handy and able to fix most small issues, he says, but if needed, he can work with Earl’s to quickly get an item back into rental shape. In exchange, Earl’s will often display a small engine product near the entrance of Kasson Hardware Hank, offering advertising as well as another location where a sale can be made. Kuball opted against a more dedicated service department at his store for several reasons, including overall store appearance and the difficulty in retaining trained mechanics. invites customers to bring their own mowers and trimmers in for yearly tuneups and repairs. Kasson Hardware Hank has developed a partnership with an area small-engine repair and sales business for the service needs of its rental products. 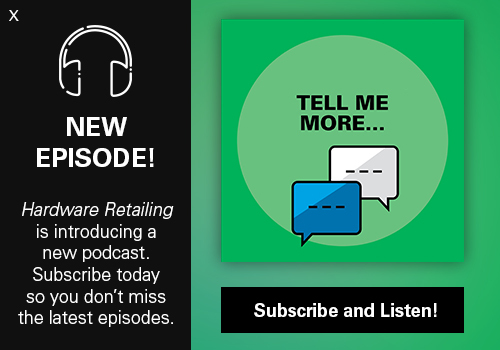 One of the key tenets of retail sales should be familiar to most in the hardware industry: The customer is always right. Cottin is quick to set this standard aside when training her employees in the rental business, believing that adage to be a dangerous way to approach a rental business. Kasson Hardware Hank and Cottin’s Hardware & Rental both established rental procedures that have kept them from experiencing too much shrinkage through lost or stolen items. A driver’s license with the renter’s current address and a valid credit card are standard procedure for renting equipment, with a heavy emphasis in favor of local addresses. Some warning signs may include addresses too far away from the community, IDs that have mismatched information or a lack of understanding of how the tool is used, Cottin says. She and Kuball have rented to contractors with addresses outside their market, but getting company and location information can help them confirm a job site is legitimate. Consider recording the license plate number of a customer renting larger equipment. Besides preventing loss via theft, training for rental also includes employees who are skilled and knowledgeable in the equipment they are renting. Along with quality customer service and being able to find the proper tool for a job, this training can help prevent injuries to customers. Training can begin by allowing employees to use rental equipment for their own projects outside of the store. 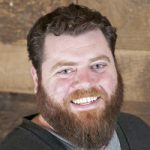 When Kasson Hardware Hank brings in a new product for rent, Kuball encourages employees to try it out at home to familiarize themselves with its use. the rental department. After learning how to fill out forms and process the rental, the junior employee can observe a more tenured employee instructing a customer on the equipment’s use. Given the risks of injury, care should be taken on instructing customers for any piece of equipment, especially for specialized tools that DIYers are unlikely to have used before. If supported by strong products, consistent service and reliable training, renting can be a positive contribution to many hardware operations.